In recent years there has been an increase in awareness that language impair­ment (LI) and psychiatric impairment (PI) frequently co-occur. Empirical data have shown that language disordered children have a significantly increased risk of developing a psychiatric disorder, and conversely, children being treated for psychiatric disorders have a high prevalence of language disorders. 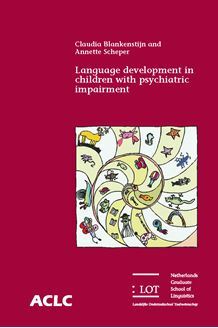 In this dissertation, spontaneous language analysis gives detailed information about language developmental patterns and the deviancies in 120 Dutch­speaking children with psychiatric impairment (PI-children) between the ages of four and ten in two genres, conversational interview and narrative. We examined the morphological/syntactic abilities to realize lexical and functional categories correctly, being particularly interested in the expression of grammati­cality, connectivity, transitivity, temporality and morphological/syntactic packaging in both genres. We also studied the semantic/pragmatic abilities to tell a narrative and to take turns smoothly, to be responsive, to repair miscommunication and to transmit relevant information, such as linking sentences coherently and cohesively, including the ability to establish clear co-referential cohesion in both genres. Our micro-level analysis results in a strong comorbid relationship of LI in the 120 Dutch-speaking PI-children. Furthermore, the language impairment in both morphological/syntactic and semantic/pragmatic areas proved to be strongly linked in this group. The PI-children with internalizing disorders proved to be less severily language impaired in both areas than the PI-children with externalizing disorders. The PI-children with PDD NOS proved to be the most severely language impaired in both language areas. We showed how severe and widespread the language difficulties of PI-children are. This fact needs to become well-known to all researchers and clinicians in the field, so that these children can be properly diagnosed, treated and super­vised in their double handicap.